Absorbent and Quick-Drying: This microfiber towel is made of 100% microfiber material and is the best towel in the game at absorbing water and drying quickly. This travel towel folds up into an incredibly small and portable mesh bag. It also only weighs a few ounces, so you won’t even notice it in your bag. Microfiber travel towel XL 30×60″ with free hand towel. Fast drying, compact, soft, light, antibacterial. 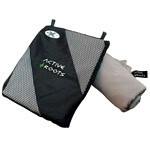 Lightweight and compact, folds into a mesh and nylon carry bag and taking up minimum room in your backpack or suitcase. This super compact microfiber towel is a fast drying towel designed for multiple uses daily. Gentle to the skin, very soft, non sticky feeling. Our high quality micro fibre towel is very absorbent, giving you that lovely dry feeling Great to take to the gym, travelling, on holiday, camping, to the beach in fact anywhere Same size as your standard bath towel Free some space up in your bag with our towel that is compact when folded flat, 22x17cm, and expands to 130x80cm.